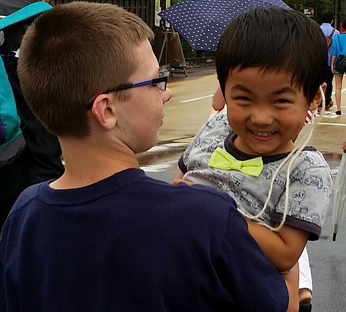 Deal Kid and his new friend, Yoshiharu. Kids are always learning, even if it’s now how you intend. Our time in Vietnam was, um, not what I planned. Between culture shock in Hanoi and tonsilitis in Da Nang I had to do a lot of scrambling to make it work. However, I’m still really glad we went. The Deal Kids picked up an amazing amount of political history: from learning why we might not want to play “War” in a restaurant (we changed the name to “go”) to what it means when 2,000 of a currency is worth 9 cents. They also stretched themselves- and stretched me- more than I could have imagined. Even you can get sick. I’m a big fan of travel insurance and it cashed in 5:1 on this trip. I was prepared for the kids getting sick. However, when I broke out into a high fever at 3AM in Hong Kong, I was NOT mentally prepared and will confess I (silently) freaked out a bit. 11 year old Deal Kid, as the only healthy one the entire trip, stepped up and took on more than he has before without asking- and made me proud. Heat exhaustion is no joke. Even in Japan the climate combined with all of the touring got to us more quickly than we expected. The first one to suffer? Black Belt and Baseball playing Deal Kid. Constant breaks, water, and remembering not to overschedule are a must. Tokyo and Hong Kong Disney? Both worth it, but choose Tokyo if you have to pick only one: DisneySea is unique in the world and a must see for even casual Disney fans. Time with other kids is a highlight. We spent two days with an English Language School in Osaka where the kids spent time with 6 Japanese kids. If you can find a way to let your kids play with local kids, even at a playground, you won’t regret it. I hope this gives you a quick taste of the posts to come (and doesn’t scare you off the concept of Camp Mom). If you have any specific questions: fire away! How did the kids do in Kyoto ? We are going to Osaka, Kyoto and Hong Kong for 3 weeks in 3 days!! and it looks like it’s going to be very hot and humid in all 3 cities. The kids did OK, once I insisted on a slow pace with lots of breaks. There’s a blog post to be written about managing expectations when traveling with kids. Don’t expect too much and you’ll be fine. Osaka and Nara were both big hits. Deal Kid told me that Kyoto was prettier but Osaka was lots more fun. I agree. I ended up comparing Kyoto to Colonial Williamsburg and Osaka to Chicago. Both good to visit, but for VERY different reasons. If you have time in Osaka I can’t recommend hanging with the kids at Kids Travel Japan highly enough. At the very least, a visit to the Osaka Kids Plaza should be on the agenda. As far as the theme parks, do whatever you can to plan your visits for weekdays. That will help immensely with crowds. I don’t even have kids and am looking forward to your reports..